Ezra Suko, a PaintAmerica Signature Member, is this weeks Friday Featured Artist. Ezra is one of the youngest artists included in any PaintAmerica exhibition. Many don't believe the art by Suko is that of an artist that is only twenty-six years old. Pictured above is one of Ezra Suko's paintings that made it into the 2007 PaintAmerica Top100, "Lights and Leaves". This has been a crowd favorite at the first exhibit of the show. Some swear there are lights behind the canvas giving the glow to the green lights and red tail lights and all wonder "How did he do that?!". 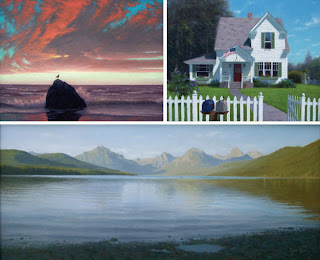 Below are three more of Ezra's paintings: "Twilight on the Pacific", 2007 PaintAmerica Top100; "Mid Summer Americana", 2007 PaintAmerica Top100; and "Lake McDonald: Late Afternoon Light", 2007 Paint the Parks100. PaintAmerica is a 501(c)(3) non-profit association, devoted to providing opportunities for artists all across America. We operate two of the top national artists' competitions in the country - the PaintAmerica Top100 for American artists, and Paint the Parks, open to international artists. Our programs build networks within the arts arena, connecting artists, galleries, exhibitors, patrons, sponsors, state and federal organizations and other funding groups for the betterment of our society as a whole. Our goals include funding for youth arts education, working with established artists to be mentors and clinicians for young and emerging artists, and acting as a clearinghouse for arts related grants and opportunities.